In this Photo Effects tutorial, we're going to take a photo and make it look like an oil painting, which is a popular and fun thing to do with Photoshop. Problem is, creating the effect requires the use of a few different filters and memorizing the settings for each one, which isn't fun, and it's also a little time consuming, meaning it takes more than five seconds. To get around that problem, we're going to save our steps as an action. When we're done, not only will we have converted our photo into an oil painting, we'll have a handy "Instant Photo To Oil Painting" action that we can apply to any photo from then on, letting Photoshop do all the work for us! Not only is this a great effect to add to any photo, amateur or professional, but if you happen to be a pro photographer, once you've saved the action, you can charge future clients big time bucks for an effect that you created in the time it took you to press a keyboard shortcut. Not that you would do that, of course. That would just be wrong. And here's the "oil painting" version. It may look complicated, but as I said, once we're done with this tutorial, you'll be able to instantly convert any photo into an oil painting without having to redo any of the steps we're about to go through. Click the "Create New Action" button at the bottom of the Actions palette. The "New Action" dialog box. Name the new action "Instant Photo To Oil Painting", or a name of your choosing, as I've circled in red above. To be able to quickly access this action when we're done, I'm giving mine a keyboard shortcut of Shift+Ctrl+F12, again as I've circled above. That would be Shift+Command+F12 on a Mac. You can assign whichever function key you like, and if you want to include the Shift and/or Ctrl key (again, Command on a Mac), click inside the checkbox to the left of their names. When you're ready, click the Record button and Photoshop will begin recording our steps. 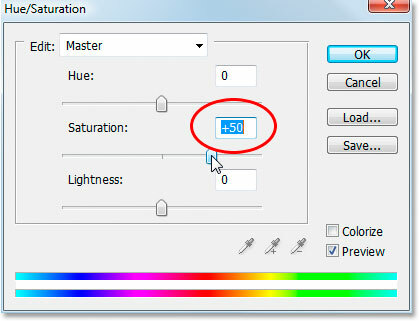 Click and drag the middle slider bar directly below the word "Saturation" to increase the saturation of the photo around 40-50%. I'm setting mine to 50% as I've circled above. The idea is to increase the color saturation until it looks like you've gone a bit too far. 40-50% should do the trick. The photo after increasing color saturation. We're going to head off into the world of Photoshop's Filter Gallery next. 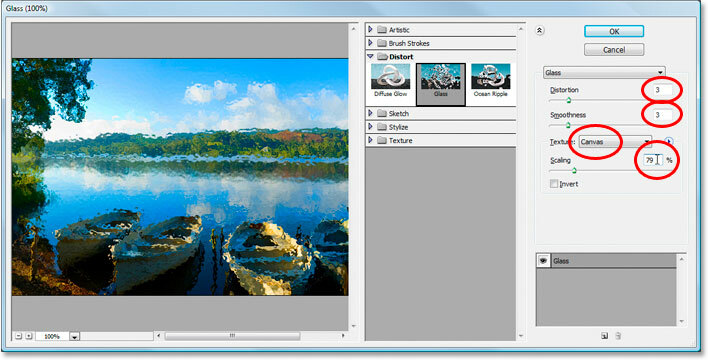 Photoshop's Filter Gallery currently showing the options for the Glass filter. It's a little hard to see in the screenshot above, thanks to the Filter Gallery being so massively huge, but I've circled the settings we want to change. Set Distortion to 3, Smoothness also to 3, select Canvas from the Texture drop-down menu, and set the Scaling value to 79%. Don't click OK yet, we have a few more filters to add. 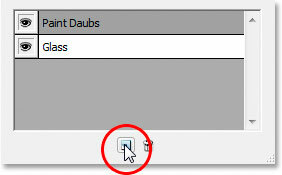 Click the "New Effect Layer" icon to add a new effect layer above the Glass layer. This will add a new effect layer above the Glass layer. The Filter Gallery showing the options for "Paint Daubs" in the "Artistic" set. Again it's a little hard to see in the screenshot, but I've circled the settings we want to change here. 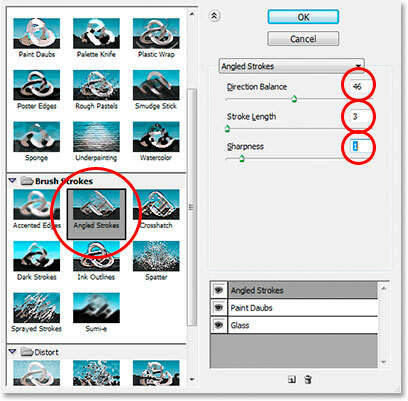 Set Brush Size to 4, Sharpness to 1, and from the Brush Type drop-down list, choose Simple. Notice at the bottom of the dialog box that it's now showing the Paint Daubs effect layer above the Glass layer (again circled in red). Two more filters to go. We need another effect layer, so once again, click on the New Effect Layer icon to add a new effect layer, this time above the Paint Daubs layer. 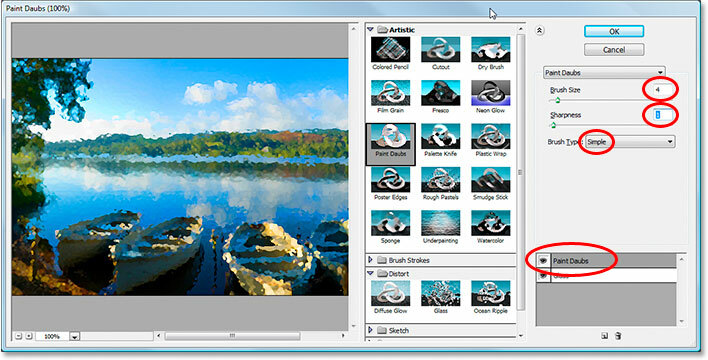 Click the "New Effect Layer" icon once again to add a new effect layer above the Paint Daubs layer. The options for the "Angled Strokes" filter. I won't bother showing the large preview area in the left of the Filter Gallery this time so we have more room to see the settings we're concerned with in the options. 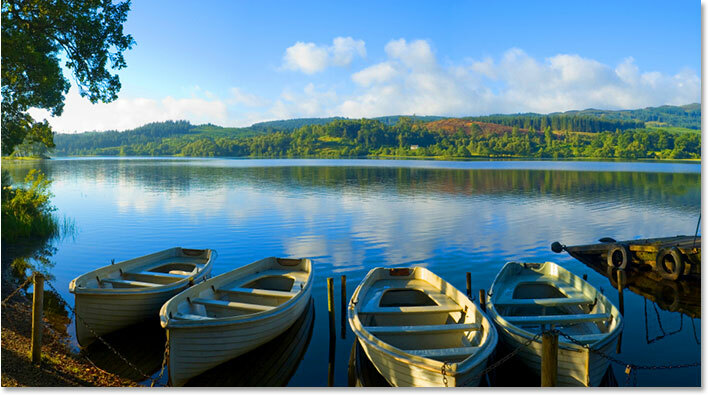 Set Direction Balance to 46, Stroke Length to 3, and Sharpness to 1. Again notice at the bottom of the dialog box that it's now showing three effect layers stacked on top of each other. One more to go! 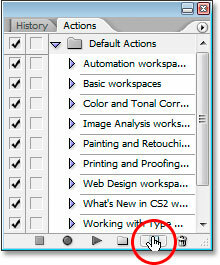 Click the "New Effect Layer" icon one last time to add a new effect layer above the Angled Strokes layer. The options for the "Texturizer" filter. Again, I won't bother showing the large preview area on the left in the Filter Gallery since it takes up too much space in the screenshot. 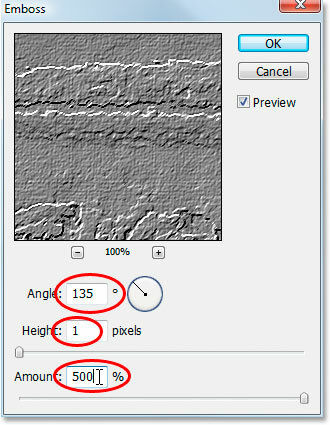 From the Texture drop-down list, choose Canvas, then set Scaling to 65% and Relief to 2. Last but not least, select Top Left from the Light drop-down menu to set the light direction. The image with all four filter effects applied. 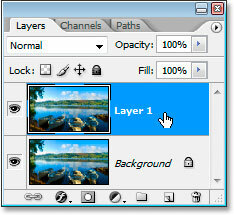 The Layers palette showing our Background layer and the copy, named "Layer 1". Normally, I'd be renaming this new layer to something more descriptive than what Photoshop calls it by default, "Layer 1", but since all of these steps are being recorded into an action and we'll never be doing this again manually, there's no point. "Layer 1" will do just fine. The image after desaturating the top layer, "Layer 1". 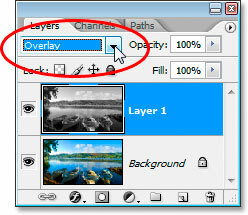 Step 12: Change The Blend Mode Of The New Layer To "Overlay"
Change the blend mode of the new layer from "Normal" to "Overlay". The current state of the image after changing the blend mode to "Overlay". As I've circled above, set the Angle of the effect to 135%, the Height to 1 pixel, and drag the slider bar at the bottom all the way to the right to set the Amount to 500%. Click OK when you're done. 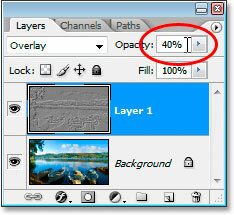 Lower the opacity of "Layer 1" to 40% to finish off the effect. Click the "Stop" icon at the bottom of the Actions palette to end the recording and complete the "Instant Photo To Oil Painting" action. And there we go, all done! Not only have we converted this photo into what looks like an oil painting, but we now have all of our steps saved as an action, which if you remember from when we started, I assigned a keyboard shortcut of Shift+Ctrl+F12 to, which would be Shift+Command+F12 on a Mac. So now, the next time I want to apply this effect to another photo, I can just use the keyboard shortcut, then sit back and let Photoshop do all the work. Just one thing to point out, depending on how powerful your computer is, it could take a few seconds (or more) for Photoshop to go through all the steps in the action, so don't worry if you press your keyboard shortcut and things seem to be moving a little slow. Just sit back and let Photoshop do its thing. And there we have it! That's how to turn a photo into an oil painting and save it as an action in Photoshop! Check out our Photo Effects section for more Photoshop effects tutorials!